Is your Texas Guaranty Waiver language up-to-date? If you have ever seen a typical loan guaranty, you probably know that it takes about one sentence to say that the guarantor guarantees certain indebtedness on behalf of the borrower and several paragraphs (perhaps several pages) for the guarantor to waive many of the defenses to such guaranty and many of the rights of the guarantor. A lender relying on such guaranty certainly hopes that it has covered all of its basis with respect to such waivers. For example, Section 43.002 of the Texas Civil Practice and Remedies Code provides that upon a lender having a right of action against a brorrower (such as for the borrower's failure to repay a loan in a timely manner), the guarantor may require the lender to "without delay bring a suit on the contract." If the lender fails to promptly sue the borrower, the guarantor may be discharged from liability under the guaranty. As you might expect, it is not unusual for the lender to seek a waiver of this right from the guarantor. This right of the guarantor to require the lender to promptly sue the borrower could previously be found in Section 34.02 of the Texas Business and Commerce Code until it (and several similar provisions) were moved to the Texas Civil Practice and Remedies Code effective April 1, 2009. Texas lenders would be wise to update their guaranty forms to ensure that references to the old Chapter 34 of the Texas Business and Commerce Code now reference Chapter 43 of the Texas Civil Practice and Remedies Code instead. Special thanks to my colleague, Paul Hendry, who brought this statutory change to my attention. Delaware's Limited Liability Company Act permits a Delaware limited liability company to have an oral operating agreement (Section 18-101(7)). Delaware's Statute of Frauds makes unenforeceable, among other things, oral contracts which cannot be performed within one year (Title 6, Section 2714). So would a provision in an oral operating agreement of a Delaware LLC that could not be performed within one year be enforceable, such a a buyout of an exiting member over a three-year period? Until recently, the answer to that question was unclear. As of August 2, 2010, the Delaware LLC has been amended to clarify that an LLC operating agreement is not subject to the statute of frauds. Let's say a company is attempting to raise $10 million, and an investor is willing to loan that amount to the company, but the investor is seeking a 25% return on the investment. 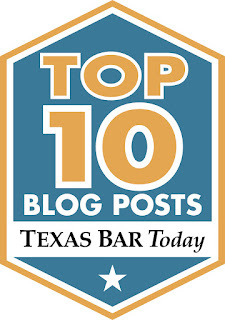 Unfortunately, the highest lawful rate in Texas is generally 18% (Texas usury laws are quite complex and beyond the scope of this post, but an 18% rate is generally permissible for typical business transactions). Does that mean the company cannot get funding from this investor? Not if the investor is willing to accept a lower interest rate with an "equity kicker." Section 306.101 of the Texas Finance Code provides that for a "Qualified Commercial Loan" certain loan charges will not be deemed interest for the purpose of Texas usury laws. A Qualified Commercial Loan is defined in Section 306.001 of the Texas Finance Code as a commercial loan of at least: (a) $3 million, if the loan is secured by real property, or (b) $250,000, if the loan is not secured by real property (with certain written disclosures required for loans less than $500,000). Among the loan charges which are deemed not to be interest with respect to a Qualified Commerecial Loan are "equity kickers" such as (a) an option to purchase capital stock or other equity securities of the borrower, or (b) an option to participate in a share of the income, revenues, production, or profits of the borrower. Thus, in our hypothetical above, the company could issue an 18% note and a warrant to purchase, say, 20% of the common stock of the company at the common stock's current fair market value, in exchange for the investor's $10 million investment. If the company's value were to grow substantially, that warrant to purchase 20% of the company's common stock could be worth a lot more (or a lot less) than the 7% interest rate (25% - 18%) that the investor gave up. Equity kickers are often a great way to bridge the gap between investors demands for high returns and interest rate limitations set forth under Texas usury laws.